Medifast Diet Review (UPDATED 2018): Does it Really Work? Medifast Diet Review (UPDATED 2019): Does it Really Work? One of the leading meal delivery and meal replacement diets serving men and women since 1980. Medifast Diet is a weight loss plan offering over 70 prepackaged foods, and suggestions for healthy meals. The plan offers 6 meals a day, with an eating schedule that allows meals every 3 to 4 hours. The diet plan is also known as the Medifast Achieve plan, and it’s said to be the company’s easiest and most convenient weight loss strategy. It’s made to help promote weight loss while still preserving lean muscle mass. Even after one finishes losing weight, the diet plan is meant to help give people lifelong support for overall health and weight maintenance. Our experts conducted many reviews and found that this was the most effective diet plan. It offers an easy to follow and supportive system to help provide functional weight loss results. For a discount on the Medifast Diet plan click on this link. Whey Protein Isolate: A by product extracted whenever cheese is made, this highly bioavailable form of protein is known for its ability to suppress appetite for hours. It’s also rich in amino acids and it is composed of a minimum of 90% protein by weight. Organic Cracked Wheat: Ground up wheat kernels which are high in fiber and trace minerals. This is organic and therefore is free of any GMO’s or harsh processing which can have remains of dangerous pesticides. Potassium Chloride: This provides the mineral potassium which is useful for regulating the proper functioning of nerves, muscles, and other vital organs. Chicory Root Extract (Inulin): Woody plant that has trace vitamins and minerals and which can be used to aid digestion. This has been shown to be likely safe when used in allowable amounts. Inulin is a starchy substance that can be found naturally in chicory. It is beneficial for supporting healthy gut bacteria, as it is not digestible and can instead feed microflora. Read more about the benefits of Medifast Diet when you visit their official website cited in this link. 4 Medifast meals: 70 different food options are offered such as sweets, soups, pastas, bars and shakes. 2 lean and green meals: This is separate from the prepackaged meals. A person chooses 3 servings of vegetables. 2 servings of healthy fats and 5 to 7 ounces of lean protein from the menu offered. 1 Healthy snack: This can be a serving of fruit or yogurt, a baked potato, whole wheat pasta, or several other offered foods. Also separate from the prepackaged foods. Click the link here to get a special discounted rate on Medifast. Their official website makes it really easy to verify what is added as they specific each ingredient added to their foods. They make sure to list any potential allergens, and they also provide the serving size, full price, and a nutrition facts list. Judging the nutrition alone reveals that they ensure many vitamins and minerals are added to their foods. This ensures that one will be able to give the body what it needs to thrive and be healthy. They also often use ingredients that are natural and wholesome. These additives are effective at providing a satisfying meal without packing on too many calories. Also provided are gluten free and vegetarian options. In examining many of their foods it’s clear to see they have dedicated themselves to provide healthy and effective solutions for weight loss. Read about what the Medifast diet can do for you by visiting their official website. Pricing can vary depending on the specific plan one chooses. For example their Flex plan is meant to deliver steady and gradual weight loss and it provides 4 Medifast meals alongside 2 lean and green meals and a healthy snack. Their Go! Plan offers 5 Medifast meals and 1 lean and green meal. These meals are one’s users can cook at home, as long as one makes sure to pick an option offered by the company. You can even customize it further by reaching the company as they offer plans for those with gluten or soy intolerance, nursing, vegetarian or those who are of an older age. Support is also provided for diabetics who need to regulate their food choices closer. Users often said they paid a fair price on these plans and the company does offer free shipping for certain orders. Overall when you look at the value given by the quality of meals, it certainly does make it a well-priced and affordable solution for weight loss. You can get a hold of the Medifast Diet with a special discounted rate when you click on this cited link. Email: A contact sheet is provided for direct messages. They also list their official hours of operation so people know when is the best time to contact them. On Consumer Affairs.com the company has been well regarded with 4 and a half stars out of 5. It’s shown how they have been recommended by more than 20,000 doctors, and that it has already helped thousands lose weight successfully. For a detailed look into Medifast and to also get it now with a unique discounted rate, click on this link to be redirected. Many said that they were not just able to lose weight, but to also keep it off long-term. There was a lot of genuine praise from people who also enjoyed the taste of the food, and who also added it was helpful for picky eaters who only liked certain foods, and who were able to customize it to fit their taste buds desires. Overall many had a resounding benefit form the Medifast diet, and they also praised its functionality to help provide support whenever people needed it. Taste wise people said it was satisfying, and that it helped suppress their appetite. As far as the actual service and overall ability to interact with someone at the company to gain more insights, there was also praise over the helpfulness of the support staff. Listed here is the official Medifast Diet website where you can read more about what foods are offered, and what the diet can do for weight loss. CONCLUSION - DOES MEDIFAST DIET WORK? The Medifast Diet consists of pre-packaged low calorie foods, as well as diet advice and suggestions for grocery foods. This is comprehensive, and many users have said the quality of foods is high. Customers noted they were able to sustain their weight loss results, and that the foods and advice offered were easy to use and helpful. This is the reason why we have rated the Medifast Diet as the best weight loss plan available. The makers of Medifast have provided full support as they offer detailed advice and representatives that users said were helpful, and made them feel welcome and unintimidated to learn about real functional weight loss results. This is why they were so highly rated on Consumer Affairs, and Web MD has also said it is a nutrient rich diet plan which can help with supporting weight loss. The only plan I could ever stick with. Personally, it didn't work for me AT ALL. I followed it strictly and even exercised on top of that. I wouldn't recommend it. So basically it works for some people, not everyone. The food isn't great either. If you follow the terms and conditions for cancellation, there is NO LINK for you to cancel via online, so you have to call and waste 20-30 minutes waiting for a representative to cancel it for you which that takes literally 2 minutes to do. My experience w customer service is now horrible. No help w locked account; no fu from customer service as promised on the phone; no contact after email requests to Medifast and Optivia. After three years of perfect service, t believe i'm done with this company. Great p[roduct . worked for me when many others failed. I found it easy to follow lost 30 lbs in 3 months and have kept off 25 for 3 years. I started on 4/2/16 . To date I have lost 32 lbs. It is a simple, effective and healthy way to lose weight.. My blood pressure and blood sugar are at normal levels, and most importantly both my doctor and I are very happy with my results. It worked for me. The food isn't great or ok but it's edible. Luckily if you have time it's somewhat easy to go off plan while staying on plan when you have an AMAZING garden, however with some family hardships I lost my way but am now back on board. Also for the one with a type 1 daughter she should be monitoring her disease and be seeing an Endo it's not Medifasts job, also just because you are going somewhat low carb doesn't' mean you can stop insulin intake for example my sons ratio is 1 for every 15 carbs plus 13 lantus a night regardless of what he eats. Personally I would never recommend a Keto diet to a type 1 because when testing Keytones how would you tell if you were in DKA or just ketosis. To me that wouldn't be worth the risk. I've tried Medifast, and can confirm that it works! Thanks for the great review. I was on medifast for 6 months. What I liked was the 1:1 consultation and support. I did lose 30 pounds despite struggling to engage fully in the system. However, I found most of the food inedible and got to the point where I was skipping meal to avoid eating much of the food. This does not work in this system as it effects metabolism. The bars are all pretty good. Some of the shakes are ok. The cereal is alright and beyond that I really struggled to eat anything and I am NOT a picky eater. The idea behind medifast is great. Problem is - the food is MARGINAL (at best) and downright DISGUSTING (in some cases). Additionally, the idea is to DETOX from sugar, but you fill your body full of chemicals and preservatives-and they are NOT toxic? That is laughable! So - if weight loss is the ONLY goal, it is good. If you want HEALTH to go along with it, find a different program! In just over 6 months, I have lost 73.6 lbs. I am off blood pressure and type II diabetes meds. My doctor is amazed at the improvement in my blood tests and calls me his 'poster child'. This program has changed my life. I have failed so many times over the past 20 years. I needed something structured, easy, convenient....and to build up my battered confidence that I even COULD lose weight, I needed to see results. This is working for me. The food is OK, I'm not hungry, I have bags of energy and I am down 20 lbs in less than 6 weeks. My daughter type 1 diabetic tried Medifast and they did not monitor her disease. She lost 17 lbs. 1st few months but had terrible high blood sugars. Now they have taken her off her weight loss program due to contract of 16 weeks and she has gain all and more back. Very discouraging for her and that they did not make an initiative to help with her to lose the way she had planned. Bad after-taste with MOST MEALS - tried for two weeks now, will not re-order!! I was unable to make it through one day. Their return policy is awful. I lost a lot of money on a diet I did for one day. I was 285lbs. Black male with history of hypertenison. So, just a step from type II diabetes and or stroke. I went on medifast diet first of nov, by the time for Easter, I was 221. All this and i wasn't strick. I like the foods for the most part. Some items "no", most yes! The food is basically in edible. No one in my office can eat more than one bite of anything I have had them try. I was so determined to do this diet I opened all the boxes and put the food in my work cabinet and home. Little did I know I wouldn't be able to eat it. This diet food is terrible! Would never recommend it and totally wasted my money. Nutrients email is much better. I can't even give this stuff away. People eat it and then have to rinse their mouth out. Total rip-off. Another lesson learned. Save time and energy by never having to grocery shop, count calories or cook your meals again. Medifast meal delivery service will send high protein meals directly to your home. By controlling portions, nutrients and calories, Medifast users can expect to lose 2-5 pounds per week for the first two weeks on the Medifast 5 & 1 Plan and 1-2 pounds per week thereafter. The Medifast Plan menu consists of shakes, bars, soups, and other sides you can pair up to create your diet or the day. 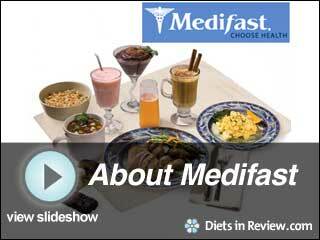 Medifast offers 70 meal choices to satisfy different palates and dietary requirements. Kosher, low glycemic, lactose-free and vegetarian diets are all supported by the Medifast plan. Medifast even has specific plans for the unique needs of women, men and diabetics. Medifast's success has been proven in multiple clinical studies, the Medifast website offers dozens of real-life testimonials, and its products and programs have been recommended by more than 20,000 doctors since 1980. A John Hopkins study found the Medifast plan helps dieters quickly and safely lose weight by decreasing the amount of calories they consume each day. The study also found that participants with type 2 diabetes lost 2 times the weight of individuals following the American Diabetes Association's dietary recommendations. Medifast also shows positive results in participants with other illnesses, like hypertension and high cholesterol. All of the Medifast products are available online, but Medifast does offer some physical centers throughout the country, in Alabama, Arizona, California, Florida, Georgia, Maryland, Minnesota, Pennsylvania, Texas and Virginia. You can choose to go to a center, but you can complete the program online just as easily. I am a 48 year old male with a fairly unactive lifestyle. On May 16, 2011 I started the Medifast diet following the 5/1 plan. My starting weight was 325 lbs. I am 11-1/2 weeks into the diet and have lost 58 lbs. The Medifast diet consists of five prepared meals and one "Lean and Green Meal." (L&GM) known as the Medifast 5 & 1 plan. Your L&GM will consist of a lean protein (a seven-ounce serving of chicken, turkey or fish, or a five ounce serving of beef, pork or lamb) with a tablespoon's worth of condiment like ranch dressing, ketchup or mustard. You will also choose your side dish, which can include a salad, or raw or cooked vegetables. You will always eat at least three servings of vegetables in your L&GM. The Medifast program encourages you to keep your metabolism high and avoid hunger by eating every three hours. It also recommends that you stay hydrated by drinking your choice of calorie-free beverage, preferably water, consuming at least 64 ounces each day. While your Lean and Green Meal and beverages are up to you, the rest of your meals will be chosen from the dozens of low-calorie, high nutritient meal-replacement items that Medifast delivers directly to you. With options like puddings, oatmeal, shakes, and scrambled eggs, it's hard to get bored. At the beginning of the program, you will remove high carbohydrate vegetables from your diet like corn and carrots, to jump start your weight loss. You'll slowly introduce these items back into your diet over time and they can be a part of your diet in the maintenance phase, if you wish. While on the Medifast program you don’t have to worry about counting anything; calories, grams of fat and carbs are all controlled and you can expect to lose between two and five pound per week. The Medifast meals are made with 24 different vitamins and minerals to keep you full and satisfy your nutritional needs. The Medifast website offers an exercise guideline document, but there is specific workout program. Medifast recommends getting daily exercise, but your intensity, mode and duration are left completely up to you. They suggest running, jogging, swimming, dancing or walking, but with such a low calorie, structured program, getting your daily 30 minutes reccommended for health should be enough for you to successfully drop weight. Medifast recommends waiting two to three weeks before introducing exercise if you do not already exercise regularly. You should also consult your physician if new to exercise. Start slow, and gradually increase you time and intensity as you feel things become easier. If you have been exercising consistently prior to starting Medifast, it is recommended that you reduce your intensity and duration of exercise for the first couple of weeks so your body can adjust to your lower calorie levels, and do no more than 45 minutes of vigorous exercise each day during this time period. Medifast suggests, as do we, that you find something that you enjoy for your workouts so you are more likely to stick to them. The gym isn't your only option. You can take up jogging outside, dance classes, swimming, or biking to get in some exercise while finding a new activity you enjoy. Common questions asked about the Medifast program by our community. Click each to see the full answer. Ask or answer Medifast Questions now. For more than 20 years, Medifast has been the answer for many people's weight loss struggles.. It’s also helped people with pre-existing health conditions, like diabetes and hypertension, lose weight safely. The taste and quality of the meals have gotten mostly positive feedback, so if you want to take out all of the guess work, Medifast may be the diet for you. You'll learn how to eat proper portions with balanced nutrition, while eating consistently throughout the day. Most programs and diets cannot boast the doctor recommendations, positive clinical findings and glowing testimonials that Medifast can. It's worth a look if you have weight to lose and are looking for a convenient, all in one approach to eating.